Well, I’m back in Vancouver after what has been an amazing road trip. Austin, Dallas and Vegas. The whole trip was fantastic! I love working in the field with MonkeyMedia Software’s customers, especially with the franchisees and their employees. I enjoy working on the front line with customers, and I especially love helping our young restaurant community members to “up their game” in the world of catering. Lucky for me, I now have this wonderful opportunity to really do the work I love! I was invited to speak at the Ben & Jerry’s Global Franchisee Meeting 2013 about catering and off-premise for their brand. I’d like to share with you what I learned as I continue on this very personal journey. My visit with the Ben & Jerry’s family was very special, completely unique and transformative in many ways. Let me just say that what I learned the most from this experience is that culture trumps strategy every single time. You see, Ben & Jerry’s is owned by Unilever, a large multi-national conglomerate with business interests all over the globe. But no matter, as part of their mission statement, activism is part of the plan for B&J. They have a corporate campaign running called “Get the dough out of politics“. It’s been that way since the beginning. So, you can imagine how nervous a multi-national conglomerate can get when their brand ambassadors push the limits of the campaign by standing up for something like this… Check out Ben and Jerry’s www.stampstampede.org. Talk about creative! Watch this video to learn more about their current crusade. It’s bold and brave, that’s for sure. I admire them for their conviction. Remember, this video below is not endorsed by the company. It is a personal project close to Ben Cohen’s heart. Nothing to do with the company! As I immersed myself into the franchisee system, I was greeted with open arms, a high level of trust and a willingness to share and learn. And so, I made sure I spent time trying to understand their ways. I joined in on their activities, attended their education sessions and spent time speaking to their group about catering and the work that MonkeyMedia Software is doing to help our customers grow the off premise sales channel. This was truly a unique life experience. You see, even though they are owned by such a large corporation, they have gone a long way to make sure that they remain responsible social citizens, as Ben and Jerry have always done. They are serious about their ongoing activism and their business culture is one of the most unique that I may have ever experienced. I met wonderful, smart, hardworking and honest people throughout all levels of their organization. I am impressed by their sense of who they are, what they stand for and the responsibility that they take to make a difference in their communities that they serve. Independence lives strong and the culture runs deep in their DNA. The have a deep belief system. Now that I have met so many people in the Ben & Jerry’s family, I am touched deeply by their passion and their unwavering focus about sticking to their core values. The culture that Ben & Jerry established early on, lives more strongly today and they have an incredible desire to act towards the common good, while maintaining an economic model that allows them to stay in business. As with all companies at this scale, they do have a business strategy that is sound. However, finding the balance between the conservative ownership of Unilever and the activism for positive change that runs deep in their brand culture, is not an easy thing. They have chosen the hard path where others would have packed up and gone home long ago. For me, their heritage and culture is so rich, that in fact, it completely trumps the business strategy. These people are connecting emotionally in their communities and their group understands that waking up in the morning to do important work is not just about money. They acknowledge that it needs to be there, but that in fact it is a byproduct of their group’s higher purpose. I learned alot this past weekend. What a gift that Ben & Jerry’s gave me this week! Thanks guys. I appreciate your trust. I am forever touched by the caring you have for our planet. Thanks for having me! Looking forward to growing catering sales with your group! Thank you for sharing this experience! I am very glad to know of the StampStampede. Here’s a thought for you: With the growth in e-commerce, wouldn’t it be interesting to stamp our electronic transactions in a similar way? Hi Susan….. The stampstampede.org is Ben Cohen’s personal crusade. I’m sure he’d love to hear more about your idea of stamping electronic transactions! 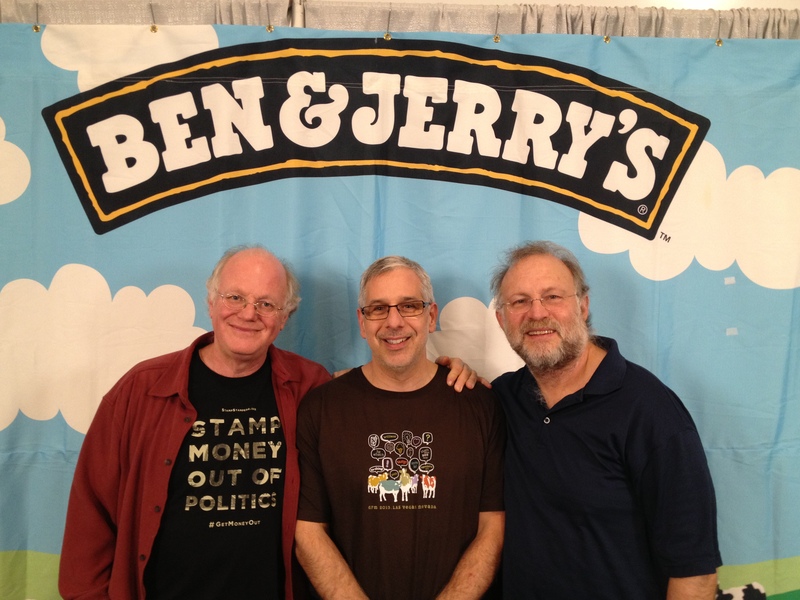 Ben and Jerry’s calls their program “get the dough out of politics”. Send them a note, I’m sure they love to hear from you! Hi Erle, on behalf of the Ben & Jerry’s community- thank you! Your presentation was excellent. Just want to give credit where it is properly due, stamp stampede is not a Ben & Jerry’s effort, it is an effort that Ben Cohen as an individual is pursuing. Our effort in that arena is called “Get the Dough Out of Politics”. Anyway, thanks again for your willingness to share your knowledge and wisdom with us. Thanks for the clarification Colette. I will make sure that I do a follow up to make sure that “get the dough out of politics” is the program to focus on. Thank you for having me. Erle, Thank you for taking the time to speak at the convention. I am a franchisee that heard you loud and clear!! Thanks again! Thank you Kari! I am so happy that you enjoyed my presentation. Just reach out if you need anything at all. Hi Erle, It was great to meet and hear you speak about catering at the convention. Your book is very helpful. Thank you again for that. I’m glad you were able to experience what we as franchisee’s feel each day as we are on this wonderful journey with Ben & Jerry’s. Hope to see you again next year! Thanks Rich… it was an awesome experience. Glad you are enjoying the book. Enjoyed your story. Thanks for sharing. I had a great experience about 30 years ago with Ben & Jerry in NYC. My wife and I were working on an ice cream together (Rachel’s Brownies) with Ben & Jerry for the scoop shops. I had my first sushi with B&J at a dive in NYC. The story is here if you are interested. I learned a lot about marketing just listening to them talk about their business which was pretty new at the time. Glad they never did a sushi stir in. Great story Jeffrey… thank you for sharing it….